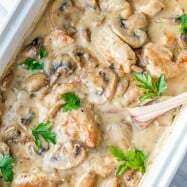 This creamy chicken casserole with mushrooms (known to some as “Chicken Gloria”), will win you over. This chicken bake is the PERFECT party dish and is a reader favorite on our blog. Galina (my sister’s mama-in-law) is an amazing cook. 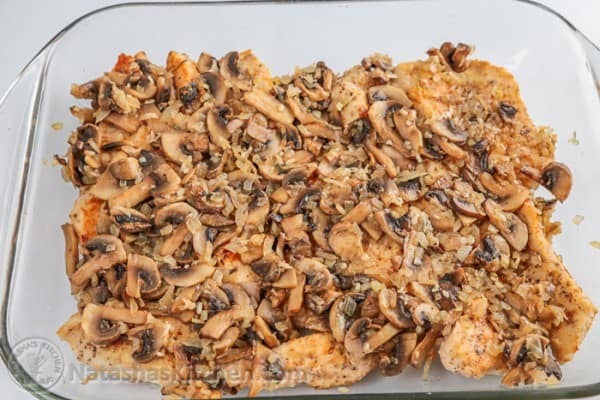 Her chicken and mushroom casserole is always a hit at our church parties and potlucks. I’ve made it several times and everyone loves it! 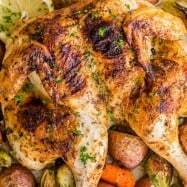 The chicken is incredibly tender – you will savor every morsel! 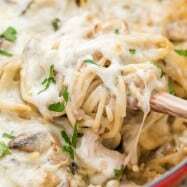 I’ve seen sorta-somewhat similar recipes online referred to as Chicken Gloria, but I love that this one uses such simple, basic and non-canned ingredients! 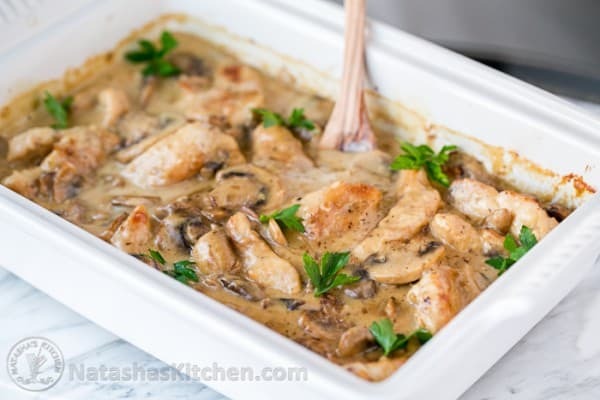 This chicken and mushroom casserole also re-heats really well (if you are lucky enough to have leftovers). You will likely add this recipe to your list of favorites. The ingredients for this recipe are surprisingly simple but they just work. 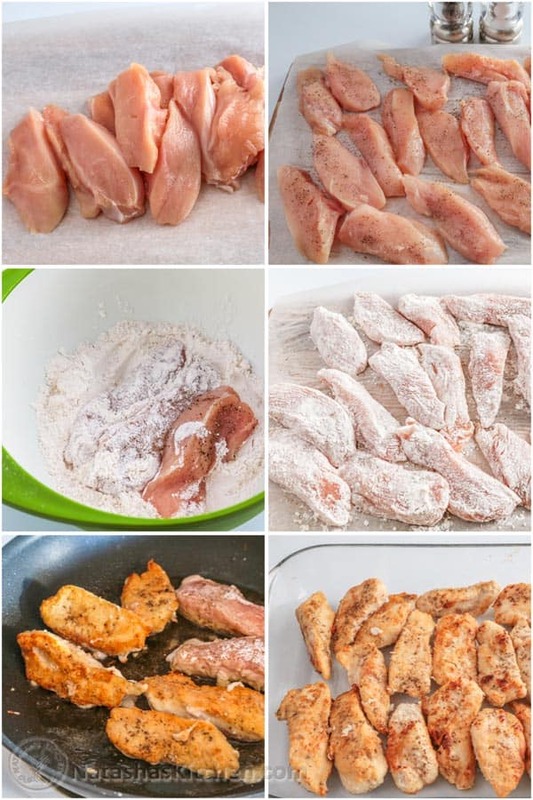 We usually use chicken breast but you can substitute with chicken tenders and skip the meat slicing step so it’s even easier. We use homemade chicken broth, but regular or low sodium would work here, just be sure to season the sauce to taste. [Print the ingredient list and instructions below]. What Is Half and Half? It is a milk product sold in most grocery stores but you can substitute with equal parts of milk and heavy cream to make your own half and half (get it? half and half? ;)). 1. Season chicken with salt and pepper and dredge both sides in flour. Heat 3 Tbsp oil in a large skillet over medium/high heat. Once oil is hot, add chicken and saute until golden. Work in batches if needed so you don’t crowd your pan. Don’t worry about cooking the chicken through; it still needs to go in the oven. Transfer chicken to a 13×9 casserole baking dish. 2. Scrape of any debris from the skillet. 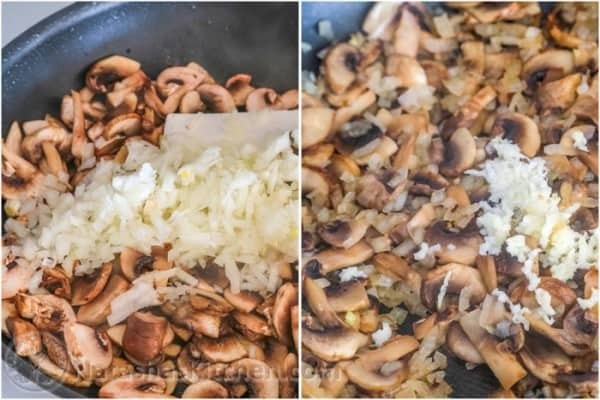 Add 3 Tbsp oil along with sliced mushrooms and diced onions and saute until soft and golden. Add garlic and saute another 1-2 min. Spread mixture over the chicken. 3. In a medium saucepan (or in the same pan you’ve been using), melt 3 Tbsp butter. Whisk in 3 Tbsp flour until lightly golden (1-2 min). 4. Add 1 1/2 cups chicken broth, 1 Tbsp lemon juice, 1/4 tsp pepper, and whisk until smooth. Add 1 cup half & half and bring to a simmer. Season with salt and pepper to taste. 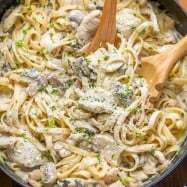 Can Chicken Casserole Be Frozen? I hope you are inspired to try this chicken bake for yourself! P.S. If you haven’t already, I’d love it if you subscribe to our YOUTUBE Cooking Channel! It’s so encouraging to see our channel grow. Your likes, feedback, and comments are always appreciated! 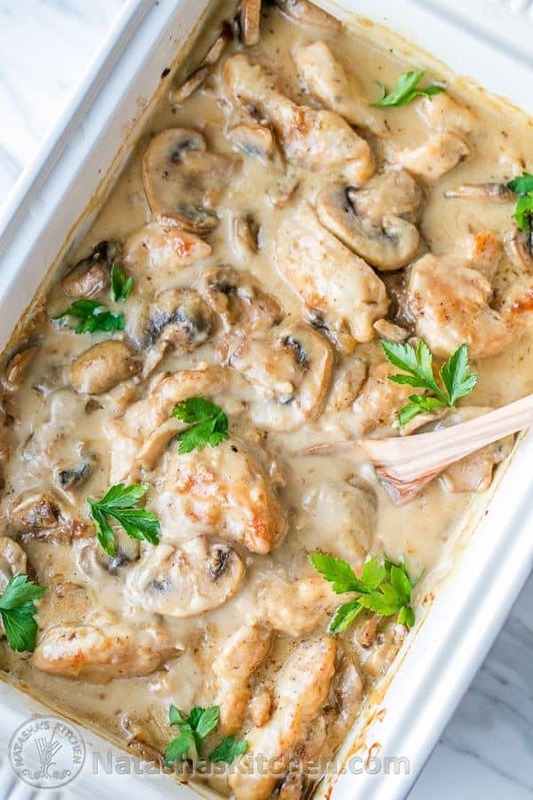 The chicken in this chicken casserole is incredibly tender - you will savor every morsel! This chicken bake re-heats really well (if you are lucky enough to have leftovers). Season chicken with salt and pepper and dredge both sides in flour. Heat 3 Tbsp oil in a large skillet over medium/high heat. Once oil is hot, add chicken and saute until golden. Work in batches if needed so you don't crowd your pan. Don't worry about cooking the chicken through; it still needs to go in the oven. Transfer chicken to a 13x9 casserole baking dish. Scrape of any debris from the skillet. 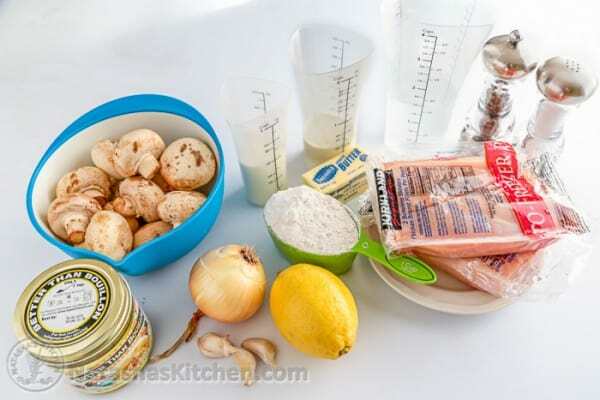 Add 3 Tbsp oil along with sliced mushrooms and diced onions and saute until soft and golden. Add garlic and saute another 1-2 min. Spread mixture over the chicken. 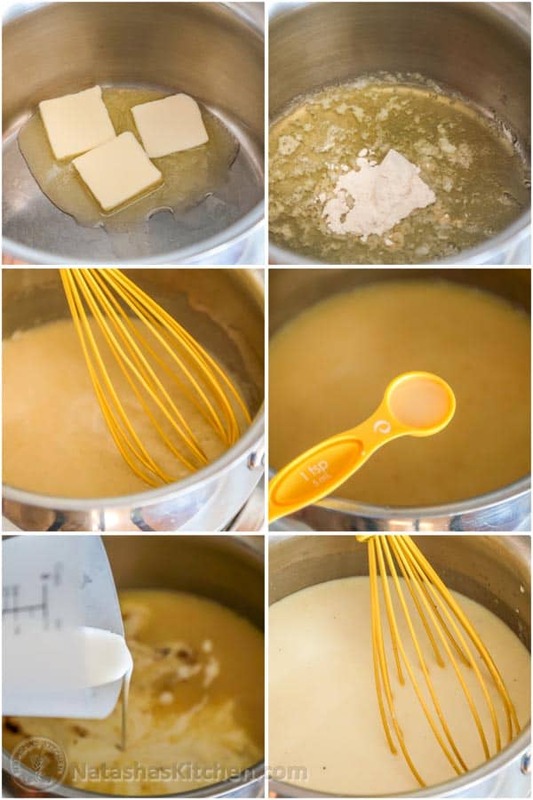 In a medium saucepan (or in the same pan you've been using), melt 3 Tbsp butter. Whisk in 3 Tbsp flour until lightly golden (1-2 min). Add 1 1/2 cups chicken broth, 1 Tbsp lemon juice, 1/4 tsp pepper, and whisk until smooth. Add 1 cup half & half and bring to a simmer. Season with salt and pepper to taste. 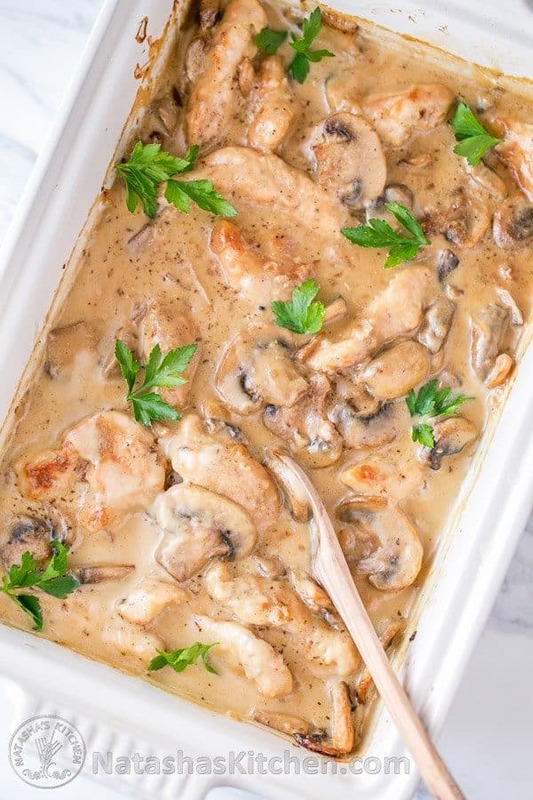 Pour sauce over the chicken and mushrooms. Cover with foil and bake at 350˚F for 45 minutes. Serve warm or hot over mashed potatoes, pasta or rice. Don't use a dutch oven for this recipe, it just doesn't turn out right - I'm not sure why. You can add artichoke to this, but don't try zucchini (turns to mush). * So handy that these trudeau nesting bowls have a pouring lip. Made this today for Easter dinner. followed the directions exactly as described, and it came out fabulous. Can other veggies be added? If so what would you suggest? Peas sounds good, my husband even suggested to add egg noodles to make it a one pot meal. Hi, I didn’t see your comment until after! I have a 14 inch pan, but even so it was a bit crowded for all the mushrooms (I did do 2lbs). They browned, but not as golden as I quite wanted so next time I will do batches. The extra mushrooms in the dish were delectable! Could even have more 😉 IMO haha. Natasha, what kind of sea salt are you using? Is it better than a regular salt? I made this casserole a few times for family and friends and each time it has gone down a treat! My young grandsons love it too. It was a hit amongst guests. The sauce was delicious, and the chicken, soooo tender! Hi Natasha. I am wondering if I can use vegetable oil for the browning step of the chicken. I just realized I am low on olive oil. Omg this was SO good! Thank you Natasha! Thanks for great recipes I like love to cook from your website. What would you recommend for freezing this. Would be okay if I put in the freezer without sauce or I will have to make and pour sauce in before freezing. 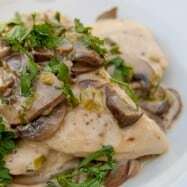 The chicken and mushroom receipe is beyond good! I try to help out my daughter by sending a meal home once a week, she is a working mom expecting her 2nd child. My son-in-law asks for this every time and my husband,who is fussy, is happy I make a patch for us. A fan but this recipe lacks flavor in the chicken. Followed recipe to a t. Went back and read recipe to make sure I did not leave something out. Did not and family agreed it needed some spices. I am sure I can doctor up but not worth the time, ingredients or effort. Hello Natasha! I made this recipe and it was well loved. I plan on adding this to my weekly rotation. I have one question though. I found the breast meat to be a little dry and not as moist even with all the wonderful sauce. 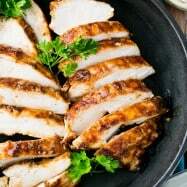 Do you know if boneless skinless chicken thighs would work better? Yes, I did cover with foil tightly and it was a 9×13 pan size. It smelled wonderful while cooking. Meat was soft but just seemed like it was covered in the sauce and not as moist but it was delicious none the less. I will try the thighs and see if it’s any different. We made this dish tonight and it tasted great but the sauce was thin. How thick is the sauce supposed to be?